Beautiful Voices is our ongoing blog series that highlights inspiring, empowering women. Our most recent Beautiful Voice is Trish Hosein, aka TRISHES. See what she says when Annmarie asks her some questions about her own personal beauty. 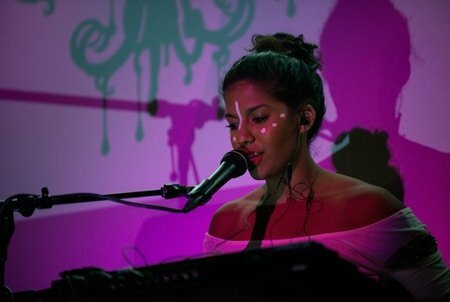 After honing her craft at Berklee College of Music, Trish Hosein became TRISHES, and began touring and opening for acts like Neon Hitch and K.Flay. She uses her wide range and knack for harmonies to create the skeleton for her undeniably original songwriting. Living in LA, she witnesses many others like herself, working hard not only on their music, but at 9-5 jobs to get by. This inspired her to write her latest single, “Day Jobs,” which is available on iTunes! My first year of college was super tough for me. Everyone I went to school with was so talented and I got really down on myself because I wasn't at their level in one way or another. I cried a lot. I don't think there was pivotal moment that I overcame that feeling of inferiority. I kept on going because for me, doing music was never an option, it was something that part of me had the absolute need to do. In a way I'm so thankful for those years because it taught me that I'm never going to be the best at anything (is anyone really?). All I can do is be totally and unabashedly, me. I would be touring internationally. It would be a dream to play music around the world. Aside from songwriting, traveling and performing are my biggest passions. The idea of doing both of those for a living blows my mind. I love different cultures and what the differences and similarities between them say about humanity and human nature. I would also probably up my arts and crafts game. Lots of spray paint. Maybe a screen printer. My performance teacher at Berklee was Livingston Taylor who, like his brother James, is a pretty larger than life character. His classes were hilarious and invigorating and really life changing. The thing he taught me that stuck with me most was “Tenacity trumps talent and good fortune.” I don't know how much I believe in talent, and by definition luck can't be controlled- but tenacity – I'm full of that stuff. We're all capable of being full of that stuff. So it was a very hopeful statement to me. Another thing that he taught me is that music isn't about sounding good. It's about making people feel something. Although one time he made us stand up and stomp a steady beat nonstop for an entire two hour class. So the man may just be crazy. I think I equate beauty with grace, and to me grace is a mix of gratitude, kindness and poise. That's what I want to do in my music. I want it to be totally, vulnerably, honest.